The stallions, of course, are the heart of the breeding program. our mares and thus strive to produce perfect foals. well in halter and does fair in harness, obstacle and jumping. He is a bood breeding stallion, producing some great foals. Shows well, and has now sired some nice foals. Sire: Lesleys Dapper Dustys Navigator - 32"
Dam: Sieverts Penny Saddle Patch - 33 1/2"
or herd sire. His color is quite unique. He is quite agile and personable. 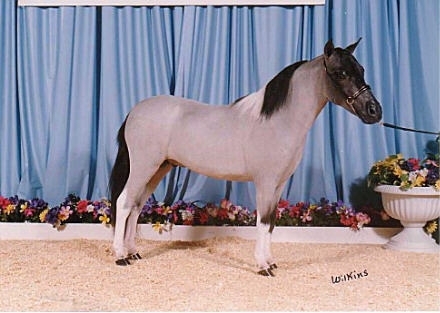 Peppy was a medium grey with white mane and tail, large star, snip, socks. He was a nice stallion/good producer. Sire: Flying W Farms Little Zorro 33"
Dam: Flying W Farms June Lilly 33.25"
Dam: Hemlock Brooks Rose 28.0"
We have some beautiful stallions for sale!